Volvo's pretty C70 has offered a discreet but stylish drop-top alternative to the Germanic norm for many years, this second generation model arriving in 2006. Volvo's pretty C70 has offered a discreet but stylish drop-top alternative to the Germanic norm for many years, this second generation model arriving in 2006. Built until 2013 it remains a smart choice for those wanting a convertible without the compromises that they often bring. The three-piece folding hardtop adds security, greater all-year weather protection and refinement when closed. Volvo's staple might be the more sensible end of the car buying spectrum, but the Swedish firm has always offered something a little bit more alluring in its range. Between 2006 and 2013 that was the C70, a coupé-convertible that replaced a pair of cars that preceded it. With its facsimile Volvo styling the earliest examples are very subtle, though after four years Volvo undertook a very comprehensive re-style that brought far more attractive, appealing lines to its range-topping model. With its three-piece folding hardtop the Volvo C70 is as practical and useable a drop-top as you'd expect from a firm like Volvo. Secure and safe too, again as you might imagine; it hasn't been tested by EuroNCAP, but has been highly commended in other worldwide safety testing. The engine range cherry-picks from the Volvo line-up, so there's a pair of sensible diesel choices and some potent petrol ones. None are outstanding, though the T5 petrol offers brisk performance. To drive it's all very sensible, it'll not thrill, but neither is it crushingly dull, as it's a comfortable, reasonably spacious place to cover miles in. Roof up it's nicely refined, with road and wind noise very well contained, though drop the roof and you'll want the fussy wind deflector in place if you're doing anything more than town speeds in it. Boot space naturally suffers thanks to the folding roof, and while it's billed as a four-seater it's best thought of as an occasional one - as in very occasional given the tightness of the rear seats. Given the C70's more frivolous nature we'd be inclined to go for the top T5 model and bite the extra costs that it brings. The fastest one here makes it shine in its best light, though if costs really matter, buy one of the diesels. 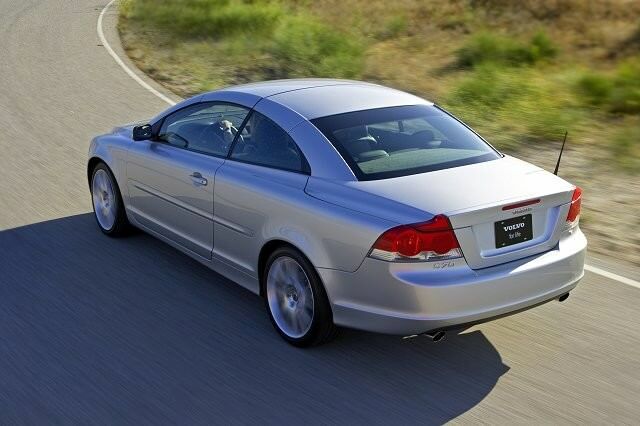 A stylish, comfortable and rather sensible take on the four-seat convertible, the Volvo C70 is a car you can buy with your heart and your head. More distinctive than its too-obvious Germanic rivals, this stylish Swede is well worth considering.